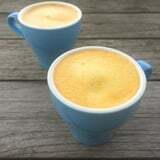 What’s that golden, frothy latte you’ve been seeing around vegan eateries? 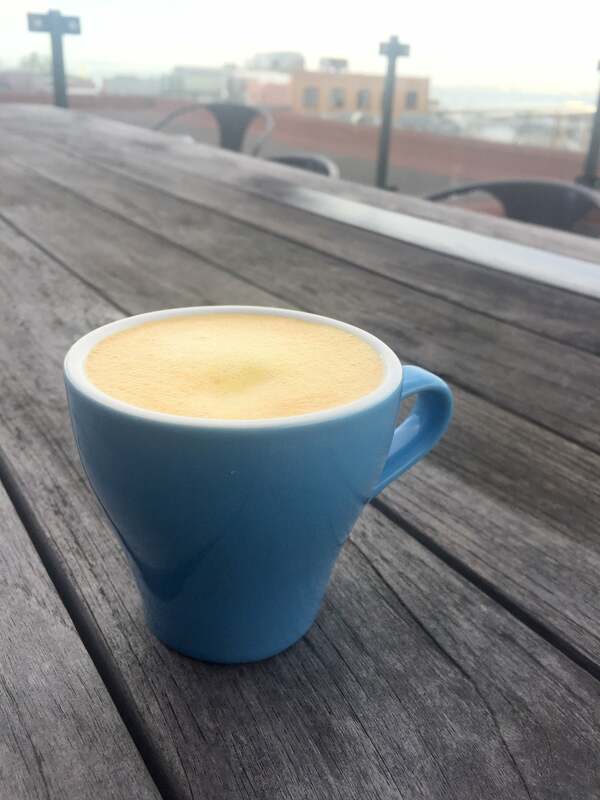 It’s a traditional Indian drink known as haldi, but it’s commonly referred to as a turmeric latte, made by blending milk (usually nondairy), turmeric, spices, and a sweetener (honey or dates). 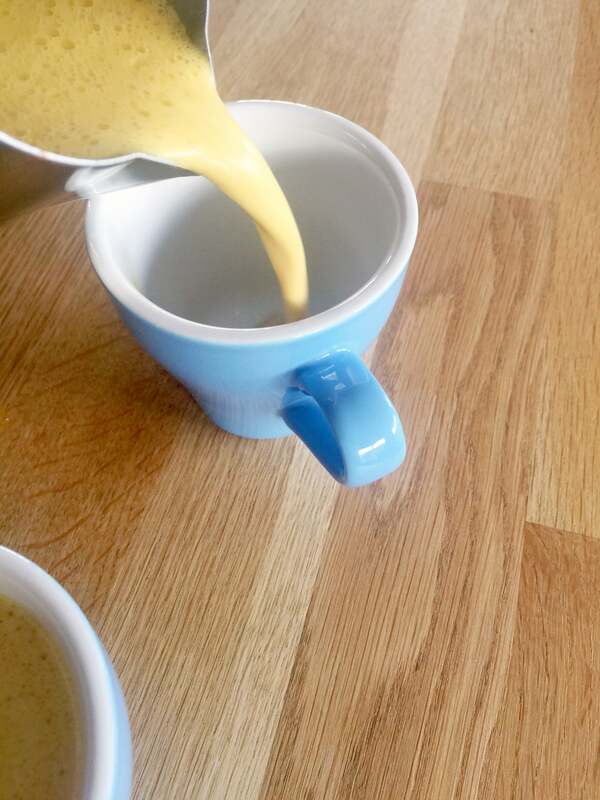 Health-conscious folks have flooded to drink this elixir over the last few years, because the numerous health benefits of golden milk, also known as turmeric milk, include acting as an antidepressant, a debloater, and a weight-loss agent. Moon Juice, a vegan health food shop in LA, helped popularize this traditional beverage with its version called Golden Serene ($12 at the shop). If the cost or the destination (or both!) keep you away from drinking golden milk, here’s the very recipe for it, printed in Amanda Chantal Bacon’s recently published Moon Juice Cookbook ($30). 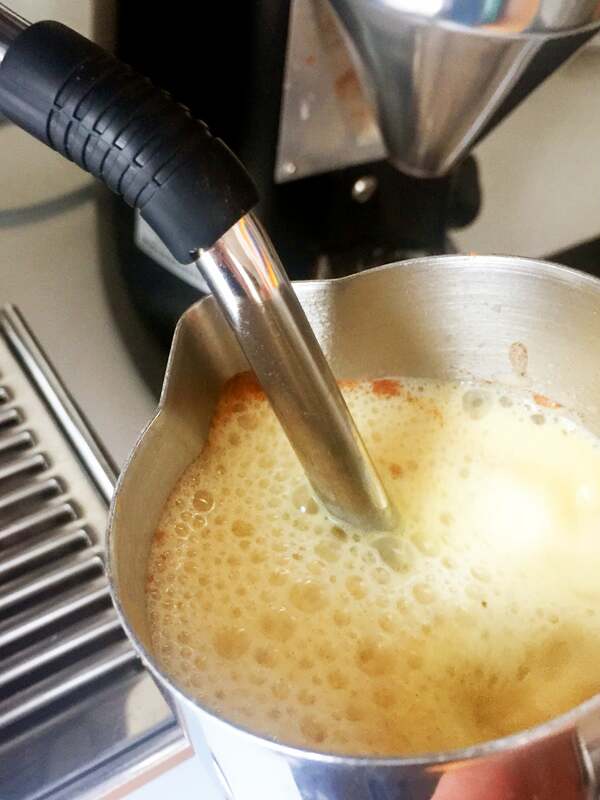 The recipe doesn’t call for drinking the milk warm – however, it’s bitterly cold here in San Francisco, so I steamed mine up to create a latte. 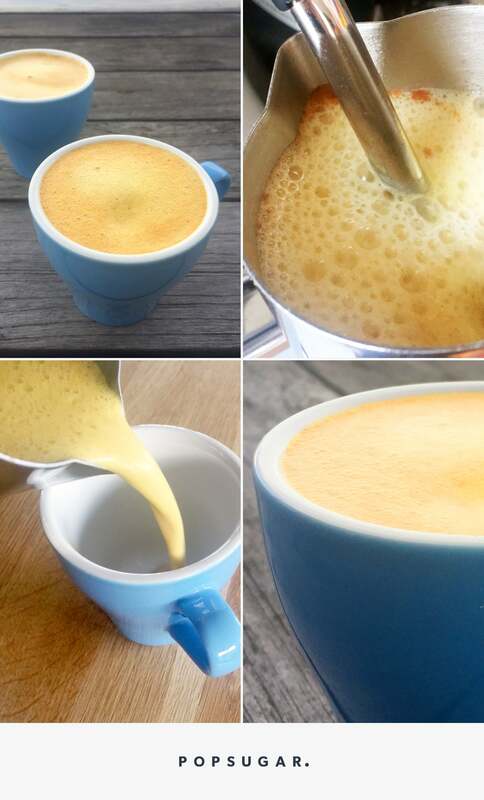 You could also use a Nespresso milk frother or, if you want to keep the beverage as “raw” as possible, simply warm the beverage up over the stove until it reaches a temperature of 118°F. Sweet, spiced, and peppery, the drink seemed to offer a much-needed energy boost in the afternoon and left me feeling warm inside-out. As someone who doesn’t love ultrasugary flavors, I will try adding lucuma, as Amanda suggests, and I’m curious about whether the powder compromises the velvety texture of the beverage. I’m also looking forward to trying it with black pepper oil. I have some in my cabinet, but I have to admit, even one drop is SUPER spicy, so I may double the recipe and start with one drop as a precaution. Golden milk is the cult moon milk. 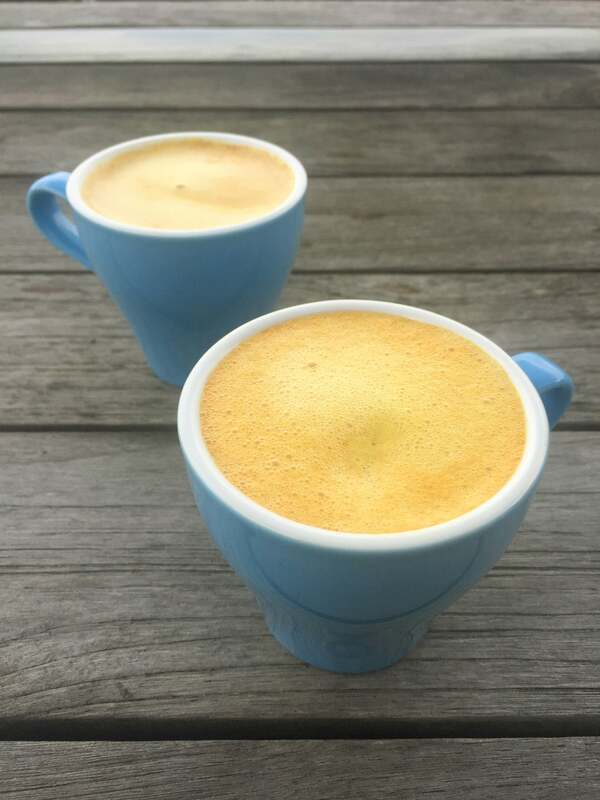 Years ago, unaware of its Ayurvedic roots, I naively conjured the idea of an ancient yogic recipe that added turmeric juice and spice into milk. This is a blend that really wants to be on the planet: From its resurrection in the Moon Juice kitchen to now being widely enjoyed by the masses, it is a luminous recipe that is equally healing and pleasurable. Turmeric root has a thousand and one virtues, including inflammation-soothing properties that are as effective as a painkiller for me. I find it works within about twenty minutes to address joint pain. This nourishing Moon Milk delivers lifetimes of pleasure and a multidimensional taste experience. It speaks to the magic of medicinal traditions that expand beyond time and space, recalling the ancient phenomena of Ayurveda. If you can’t get fresh turmeric, you can substitute 1/2 teaspoon of ground turmeric but it will have a distinctly different flavor. Enriching this golden potion with 1 teaspoon lucuma powder adds to the inflammation-taming benefits of the turmeric, and will help you cut down on the honey content, enhancing the inherent sweetness of the fresh turmeric root juice. Try halving your honey, or use none at all!